SEO ROI: How Much Revenue Does SEO Really Produce? In most areas of your business, it’s easy to see your revenue streams. You know which SKUs get the most sales. You know what your money makers are. But seeing how SEO produces more revenues isn’t as easy. Often the endless industry jargon and overwhelming amounts of data get in the way. It’s hard to make the connection. But SEO ROI can be very clearly measured. The connection between increased revenues and your SEO efforts can be transparently demonstrated. It’s simply a matter of understanding how SEO ROI is generated and in what ways it increases revenues and cuts costs at the same time. No more wondering what SEO can do for you. Let’s explore the revenues SEO can really produce for your business. More traffic in and of itself doesn’t increase revenues. If that traffic isn’t taking revenue-generating actions, it’s useless. But traffic is very important to factor in when you’re discussing SEO ROI. You can’t sell something to someone if they can’t find you online. If no one visits your blog, you can’t earn revenues from clicks on affiliate ads. One of the primary results of SEO is that it makes your site more visible in the organic search results. That’s the regular search results, excluding the ads. Over 50% of traffic around the web entered websites by clicking on them in the organic search results. That means that websites who have invested in SEO are getting over 50% of the total traffic across the Internet. And if they rank on the first page, they are seeing over 90% of that traffic. If you drill down into local search results or a niche market, the percentage is often even higher. SEO does this by getting you out of obscurity on page 10, 5 or even 2 of search results. It gets you onto page 1 where people can actually see your website. 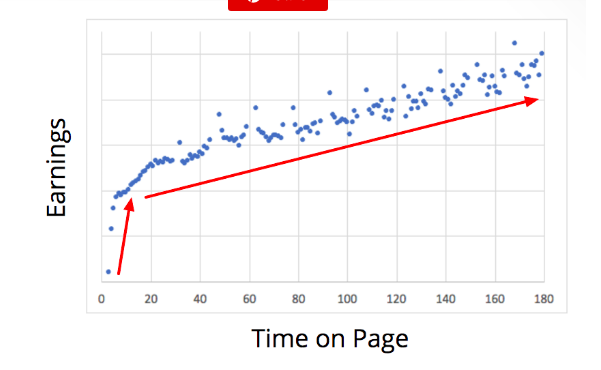 Over 90% of traffic goes to page one. About 60% goes to websites in those top 3 spots. One of the first measurable indicators that you’re getting an SEO ROI is that organic traffic is increasing. In order to know where you stand and how to improve your organic traffic, you need to look a bit closer. Find out which search terms people are using to find your website. Use paid tools like Proranktracker, SERPS or Serpbook to find out which searches you’re appearing in based on keyword phrases that relate to your website. These show you how high you are in those searches. SEO stands for “search engine optimization”. Optimizing anything is never a guessing game. It relies on analytical tools and proven strategy. Deciphering these detailed analytics is why most small business owners hire a professional SEO agency to help them optimize and improve ROI. If you’re ranking 1-10 for a search term, that means you’re in positions 1-10. Positions 1-10 are shown on page one of search results. If you’re ranking 80 or 100 in search results, then chances are you’ll never be seen. Leverage this insight to improve visibility further and maximize your SEO ROI. As we dig in deeper throughout this article, it will become clearer how and why SEO increases visibility and generates traffic. You’ve got traffic coming into your website. And you’re not having to pay for every visit like you would with search engine advertising. But the quality of this traffic matters. When you have a completely integrative SEO web design, these types of visitors equal higher revenues and profits. An SEO web design is built inside and out with the target customer in mind. Every image, feature, tool, design element and piece of content is built to appeal to and draw in this kind of traffic. Doing extensive competitor analysis. You have to know who the competition is and what they’re doing in order to develop and implement an effective strategy. Researching your existing customers. Use your own customer data to understand who to target and how to target more people like them. Researching your industry’s customers. It’s not just about knowing your job. You need to learn what your target customers are searching for related to your business. What devices are they on? How do they speak? What technologies do they use? Networking with other high authority industry, news and educational websites. Building a dynamic user-friendly website. Adapting to changing trends, needs, goals and technologies. SEO isn’t a one-time thing. You need ongoing SEO to maintain your visibility in search engines. Search engines prefer websites that are current and updated frequently. They hide sites that appear dormant or out-of-date when it comes to SEO. This leads us to the user experience. Search engines like Google track and analyze how people respond to your site. They offer what they found out about your site’s user experience in the Google Analytics tool. When you start using this tool, you may be shocked that you can get this kind of analytics insight for free. But Google does have a hidden agenda. They want you to use this free tool to continue to improve your user experience. When users (your customers) are happy, Google is also happy. More people are finding what they’re looking for. More people are using their search engine. Google benefits by giving sites like yours more visibility in searches. That’s the basic principle behind SEO. It’s a win-win-win for you, Google and the customers you want to attract. SEO streamlines everything behind the scenes (programming) and on the page (visual design, content) to provide the best user experience possible. These activities generate real revenues for your company. Don’t take our word for it. Let’s look at the data from industry-leading experts. 44% of people who visit a site that isn’t user-friendly will share their negative experience with at least 5 people. If that 5 includes social media and reviews sites this reach goes much further. Every day, there are over 2.1 million negative brand mentions added to social media. People tend to trust negative things people say about brands on social as long as it doesn’t appear the person has an agenda. 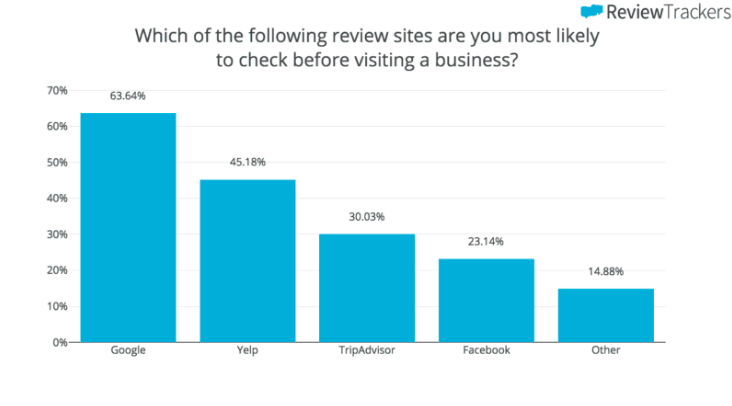 90% of people now check online reviews before buying from a business. 88% of people say that they generally trust online reviewers. 94% of people say they often avoid businesses below a 4 rating. On a more positive note, a recent study from the prestigious Forrester Group research firm found that businesses who invested in an optimized user experience (which is a huge part of SEO) increased revenues by 400%. Seamless navigation eliminates frustration when people can’t find something or feel overwhelmed with choices. Design and features demonstrate to visitors that you “get them”. You understand who your site is for. You speak their language (figuratively speaking). Helpful, actionable and valuable information people are actually looking for shows you care and are transparent. Overall design shows that you value your customer’s time and money. If anything seems too off, they will not stay. If site loads slowly, they may not even get to your site before leaving. There is a direct positive correlation between the length of time someone is on a page or site and revenues. Attracting the right audience and providing an excellent UX through SEO are what makes this possible. SEO buys you time by quickly showing the visitor that your website is the place to be. Your bounce rate is a measure of how many people visited your website and left without clicking on anything. As a general rule, a high bounce rate indicates that they didn’t find what they were looking for. However, a bounce rate on a piece of long form content like this one is often higher. The person finds what they’re looking for by staying on the page to view the content. Because of this bounce rate and time spent on page should be looked at together to get the whole picture. Google gives less visibility to websites with a high bounce rate. That’s generally 60+%. They assume you’re not providing a good user experience. This may not be true at all. The person may have found exactly what they needed quickly and then left satisfied. But if you haven’t invested in SEO, this false perception will influence your rankings. We’ve all been in positions where a person’s perception of the truth is as important of the truth itself. SEO’s role isn’t only to deliver a great user experience on the site so that Google rewards you with higher ranking. SEO applies strategies to actively demonstrate that you are delivering a great user experience. That way, Google knows the truth and can reward you with higher rankings. Micro-conversions — these are little actions that you ask a person to take. They not only reduce bounce and lengthen a session. They get people invested in your brand. Clear and visible call-to-actions. People like to know exactly what you want them to click. An SEO web design has clear calls to action that direct people to key pages on the site. Integration of analytics elements that help Google better understand how a person interacted with a page. For example, let’s say you have a slideshow or video on a page. You can add analytics code that tracks how long people watch it. Or track how many slides they view. Even though the person didn’t click to another page, this will count as a micro-conversion to reduce your bounce rate. Without the code addition, however, this may look like a bounce to Google. Optimized navigation. Not having a menu on some pages is as important as having an intuitive menu. For example, on landing pages, you want a person to do 1 thing. That’s to click your call to action. Removing the menu doubles your chances of accomplishing this. SEO web design is smart design based on scientifically-proven strategies designed to maximize your SEO ROI. Forrester Group also found that the conversion rate of an optimized page is 200% higher. SEO web design is maximized for conversions. That’s more visitors becoming solid leads. And it’s more leads becoming paying customers. But maximizing for conversions doesn’t just mean putting a call to action everywhere. Maximizing for conversions requires an in-depth understanding of human behavior. It needs balance. If selling disrupts the user’s experience, people will leave. A great example of this is a popup that appears when someone first arrives on your site. Usually, this is a bad idea. But having no CTA can hurt conversions. People don’t know what you want them to do on your website. Your site achieves an SEO ROI by using analytical tools to achieve this balance. It’s easy to think that a customer’s first interaction with you is when they show up on your website. But the average digital journey from awareness to becoming a paying customer takes 7-13 touch points. They see you on social media thanks to your social media marketing efforts. They may subscribe to your email newsletter. Each of these touch points gives them an opportunity to get to know you. They decide whether or not to become a customer. One of the ways that you get an SEO ROI is by increasing these touch points at a lower cost than paying per click for an ad. People see you in the regular search results more often. They then visit you more often as they continue their journey to becoming a customer. 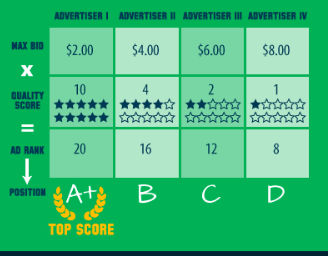 Paid advertising is an important part of any business marketing strategy. SEO doesn’t replace paid advertising like AdWords or Facebook Ads. But it’s a very important part of a comprehensive marketing strategy. In fact, it can make or break your ad campaign. Lack of SEO can actually increase how much you pay for ads by 400%. And we’ve already looked at how much SEO raises revenues and conversions. SEO helps you get the best ROI on all of your marketing efforts. The online magazine Search Engine Land reported the results of their study that found the following. 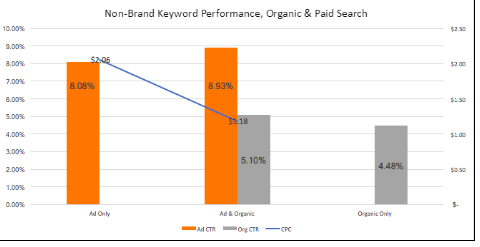 When a business runs an ad on a page where they are also visible in the organic search, it’s nearly 100% more likely to be clicked in a non-branded search. Non-branded simply means that the searcher wasn’t looking for a business by name. When you post an ad on another platform, you most often direct people back to your website. If that site isn’t optimized for user experience and conversions, you pay for a click. Then you miss the opportunity. Is your site slow, confusing or not mobile friendly? Are your ads pointing to pages that don’t offer a seamless transition from one platform to another? Then your ads won’t perform as well as they could. You might even be paying 60% – 90% of the initial purchase in acquisition costs. It’s hard to grow with that business model. Google AdWords has something called the Quality Score. They look at how people react to your website after the person clicks the ad. If people are fleeing, then the Quality Score goes down. People with higher scores as little as 1/4 what those with bad scores pay. During the bidding process, AdWords multiplies your Quality Score by your winning bid amount to determine how much you pay for the ad. Here’s a great example from Wordstream. Facebook has a similar system called Relevance Score. With an ad campaign, traffic often stops when you stop running ads. All most all of your ROI comes while you’re running the campaign. That’s especially true if you haven’t put some effort into building brand awareness. Or if you don’t have solid customer retention strategies in place. But one of the reasons SEO ROI is so high is because it pays you back over the long term. That is as long as you do ongoing SEO to tweak, refine and adapt to changes. Out of sight out of mind. This age-old saying is especially true when it comes to customer loyalty in the digital age. Customer loyalty still exists today. But people have many more options. There are more distractions. It’s so much easier for a competitor to lure someone away. In fact, 55% of people say that they would leave a long-time brand in an instant. All the competitor has to do is offer them a compelling discount. Complacency has no place if you want to keep your customers once you’ve acquired them. A company that increases customer retention by just 5% can nearly double its profits. How does this math add up? Several factors go into this statistic. It costs 5 times as much to get a new customers as it does to keep them. 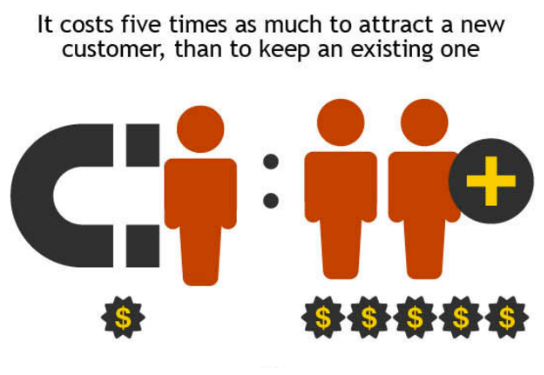 Existing customers will spend over 60% more on each subsequent purchase than a new person. They’re also almost 70% more likely to try your new products or services. And if you make a mistake, they’re also more forgiving if you handle the complaint professionally. They’re less likely to write you a bad review. They’re much more likely to become a promoter. SEO plays a huge part in keeping customers happy. Happy customer are a big part of the SEO ROI you can look forward to. 90% of Forbes Global 500 think that customer experience will become the key battleground over the next few years. It already is to a great extent. How Does SEO Reduce Churn? On top of providing a better customer experience when they visit the site, it helps you stay top of mind with that customer. They will see you more often. When they’re looking for something that you sell, they’ll gravitate toward the name they know. If they don’t see you in that search, they may not realize that the brand they know provides what they’re looking for. They end up going to a competitor by default. That’s no way to lose a customer. In addition, part of SEO is delivering consistent, helpful, engaging content on your website that your customers value. This kind of attention to the customer experience and need even after they’ve made a purchase resonates with people. It keeps them coming back. Build your SEO content strategy around being helpful to both potential and existing customers. 81% of people do research online before buying. The average buyer will review 3-5 pieces of content on your site before contacting you. The Internet has replaced the early stages of selling that was once handled by a sales team. Chances are by the time your salesperson speaks with a person, they’re already well-informed about the product or service. That’s thanks to your ongoing SEO content. Another Forrester Group study found that customers don’t want to contact you for help. They want you to provide what they need through online content. 81% of people prefer a self-service model that allows them to find the answer. Creating this self-service content is a major part of SEO. Because of this you should follow these best practices when trying to achieve a higher SEO ROI. How is SEO increasing your revenues? We’ve looked at many of the ways SEO both increases revenues and cuts cost for business. We’ve heard from thought leaders regarding its impact on your business. We’ve seen the supporting data that confirms that SEO ROI not only exists but also thrives with the right strategy. An SEO web design is a firm foundation on which all of your marketing efforts thrive. To learn more about how we can help you apply SEO to grow your business, contact us today.